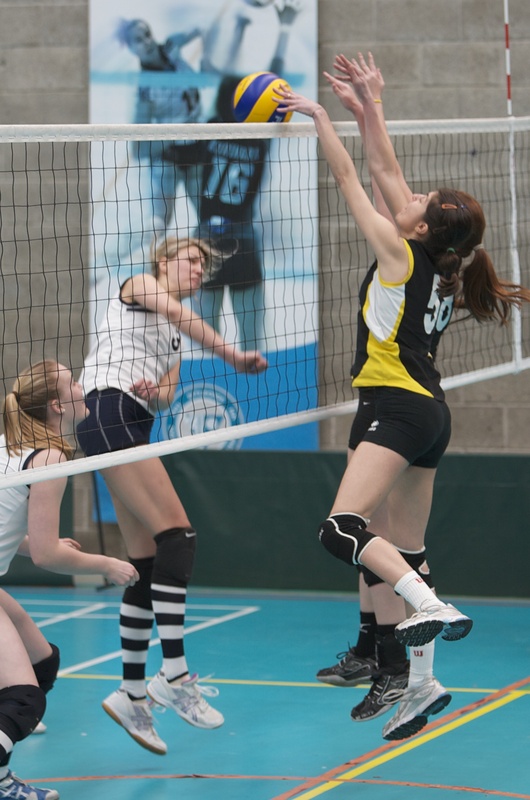 Aer Lingus and Santry volleyball clubs both added Association Cup titles to their premier league victories in two magnificent matches held in UCD today. In the men’s cup final, Aer Lingus beat Ballymun Patriots in a five set epic. The Alsaa team, winners two years ago, battled hard to win the opening and then went two sets up. They looked like closing out the match in the third, but Ballymun, whose serving had been weak, stormed back to take the next two sets so forcing the tie-breaker. This was nip and tuck until the end when Aer Lingus found the two points they needed. In the women’s decider, Santry, who won this title a few years back, were facing a formidable Trinity team that has had steadily improved all year and dumped out the title holders DVC in the semi-finals. Association Cup finals, UCD Belfield. Men – Aer Lingus bt Ballymun Patriots 3-2 (26-24, 25-16, 18-25, 23-25, 15-13). MVP:Kieran Moran (Aer Lingus). Women – Santry bt Trinity College 3-1 (21-25, 25-20, 25-21, 25-17). MVP: Laura Jahnke (TCD). Madeline Perry won a fifth women’s title at the Cannon Kirk Homes Irish Squash Open held at Fitzwilliam LTC in Dublin. Perry, currently world No 11, but as high as No 3 in the past, took an hour to beat Guyana’s Nicolette Fernandes , who is world No 31. Perry took the opening two games 11-5, 11-9, and after Fernandes took the third 8-11, wrapped up the match with an 11-3 scoreline in the fourth. Next up for Perry is the European Team Championships, where she will team up with Aisling Blake, who was knocked out of the Irish Open in the first round. Malaysian player Mohamed Nafiizwan Adnan beat Omar Abdel Meguid of Egypt to win the men’s title 3-1. After close to 2,000 matches, the Dublin and District Badminton leagues came to an end on Sattuday, with Pembroke beating Mount Pleasant to take the Division 1 mixed title. Match of the day saw Boyne beating Old Bawn by a single point to take the Division 3 title after the teams were tied on games and sets. Boyne also won the Division 4 title, beating PSLC in the last mixed game of the match – and the last game of the Dublin and District Session for 2012/13, finishing just before midnight. Wining the Club of the Year award, renamed the Cormac Breslin Perpetual Trophy in memory the late Cormac, one of Ireland’s few Olympic-class umpires, was Ailesbury Badminton Club. Knocklyon bt ESB 5 – 2. Div 8: Danum bt Roundwood 4/11 – 3/7. Div 9: Clann Mhuire bt Danum 5-1. Sycerika McMahon won the 200m individual medley for a sixth title on the final day at the Carlton Irish Swimming Championships. Ealeri in the competition, McMahon had won the 400m individual medley, 100m, 200m and 400m freestyle and 200m butterfly. Limerick swimmer Fiona Doyle added the 200m breaststroke to the 100m breast stroke title she had won a day earlier. In the 100m race, Doyle knocked .14 of a second off Sycerika McMahon’s 2012 record with a time of in 1:08.23 – enough to qualify her for the World Championships in Barcelona next July. Just half a second outside the World Championships mark on Saturday was Barry Murphy who won the men’s 100m breaststroke in 1:01.35. In the relays, UCD (Aisling Cooney, India McGlynn, Shauna O’Brien and Shani Stallard) improved on their own senior record of 4:23.48 in the women’s 4x100m medley relay. Bangor set a new junior beat of 4:28.74 in the same race, while Ards set a new junior Irish record of 3:56.15 on their way to victory in the men’s 4×100 medley relay. Luke Sutherland won Youth A boys and Eimear O’Neil Youth C girls at the Scottish Saltires Pentathlon in Aberdeen..